Hemingway liked to call them cojones, possibly to avoid censorship, or possibly to prove he was smarter than the rest of us. There was an amusing aside among the comments on Scott Kernaghan's post today about his Bing No 2, along the lines of not making jokes about only "having one nut". I'll tell you who does have balls, as in the sense of tener cojones. In case, because of changes made to it, some of you missed young Typospherian Jasper Lindell's post headed "High school journalism doesn't work", and his outburst about censorship of the school newspaper he edits in Canberra, please do yourself a favour and read it here. I know Jasper won't mind me calling him "kid"; he's mature enough to know it's meant in the nicest possible way, and not in the least bit belittling. Jasper is a young man who is well-read, erudite and highly intelligent. He would grace any future newsroom. And besides, as Hemingway might also have said, I like this kid's style. Grace under pressure and all that! My own feeling, putting this little story into its proper context, is that school authorities are being absolutely gutless to put the blame on a 15-year-old for doing what he believes is the right thing to do. To write the truth. His ambition is to be a real journalist, and he will be a good one too. At this age he needs to be pushed along, not discouraged. Really, what sort of example is the school setting him here? Certainly not one of taking responsibility, as they are meant to do. It’s a classic backdown by the school, slapping itself in the face for the privilege of having a student newspaper. They'll never have another editor as good as this guy. 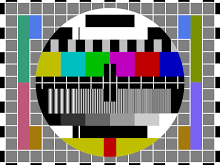 This is the signal which comes on your screen at the end of the night's television transmission. It's also the image that goes with Jasper Lindell's typewriter blog. If idiot school authorities continue to refuse to "handle the truth", it could signal the end of a budding journalism career. Are journalists who simply want to tell the truth so abundant we can afford to let this happen? What is education all about anyway? Knocking the stuffing out of kids so they will conform to what is perceived as "standard, non-radical" behaviour? I think the Press already has enough conformists. I'd like to see one emerge who isn't afraid to use his own voice.